Good evening! Jen (Miss Boo) asked some of the past CAS design team members from splitcoast stampers to make a card for the clean and simple challenge for tomorrow and I was thrilled she asked me. The challenge this was is a color challenge using the colors- white, old olive, and night of navy. I love the CAS challenges and as many of you know CAS cards are my very favorite. Since today is my wedding anniversary I decided to make this an anniversary card. Hubby and I met 12 years ago today and we were married on the same day we met (we're married 6 years now and he's still the best husband ever!). I colored my image using my Stampin' Up! markers and then I cut it out using my labels framelits. The night of navy layer behind my stamped image was cut out and I punched the corners using a corner rounder punch. My old olive layer was dry embossed using the vintage wallpaper embossing folder. It's hard to see, but just below my ribbon I added a few score lines using my simply scoring board and then for my embellishment I added some night of navy ribbon and a button with some twine tied through the center. Thanks so much for stopping by! Have a great rest of the evening. I'm going to work on some more cards while my kiddos are sleeping. Happy Anniversary, Patty! You've made a beautiful CAS card and I love those colors together! Wonderful card- and Happy Anniversary to you!!! How cool you got married on your Anniv date! 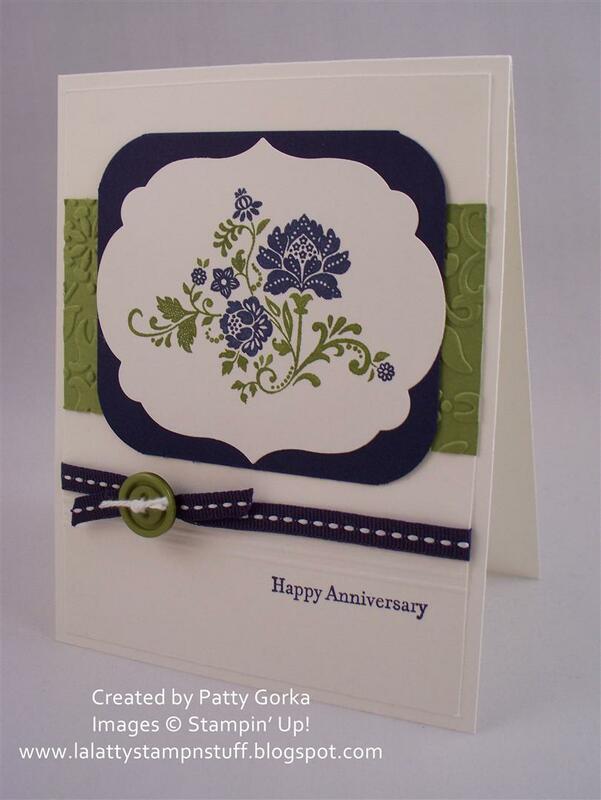 Love the green and blue colors on this pretty card - the floral stamping is lovely! Love it Patty! The way you did the focal point is great against the white, and I love the use of score lines! Pretty card! I really like those colors together. The die cut shape is perfect and layered great. I love the navy and green together! Beautiful card! Very Pretty Card--love the colors! Eeek!!! You always "wow" me, Patty. I love the colors, the coloring on the stamp, the scoring detail...simply fantastic!